If you know me via this blog, you know that one of the BIG ways my family saves money at Disney Parks is at meal time. I’ve written about saving money on food at Disney on my popular post, 7 Tips to Save Money on Food at Disney Parks. I’m back with MORE frugal Disney tips! 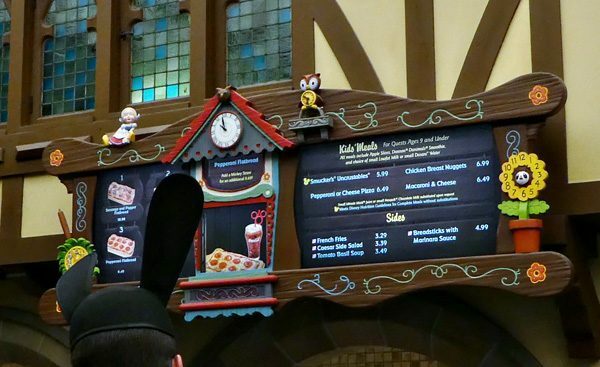 Check out these ways to save money on food at Disney parks. Contrary to what you’ve heard, Disney vacations don’t have to be expensive. 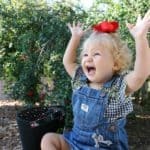 You can do a cheap Disney vacation and these ways to save money on food at Disney will help that vacation budget a lot! Using these tips (and the other advice I share in the links) you can do Disney on a budget. Please note that I use affiliate links in my post. Clicking through and making a purchase through my link helps me in a small financial way, thank you! 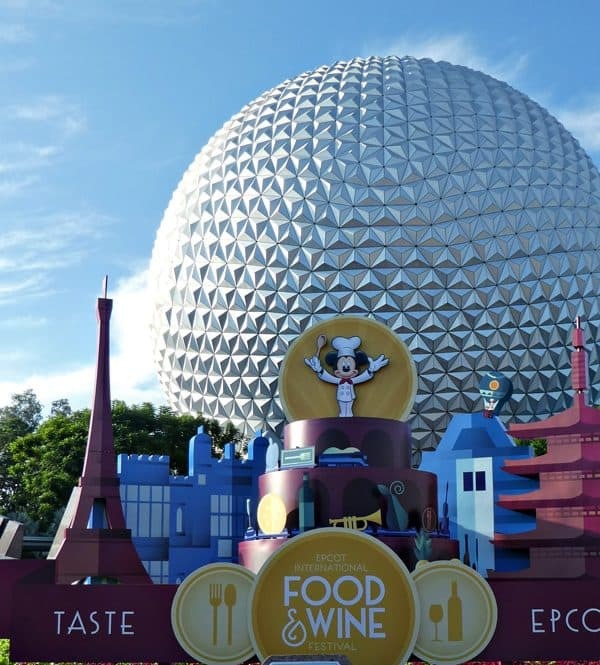 Special dishes can be found in the kiosks at Epcot International Food & Wine Festival, Festival of the Arts and Flower & Garden Festival and Disney California Adventure Parks Festival of Holidays. These plates of food are of high-quality and can’t be found outside of the event but for for that, you’ll pay a premium price! 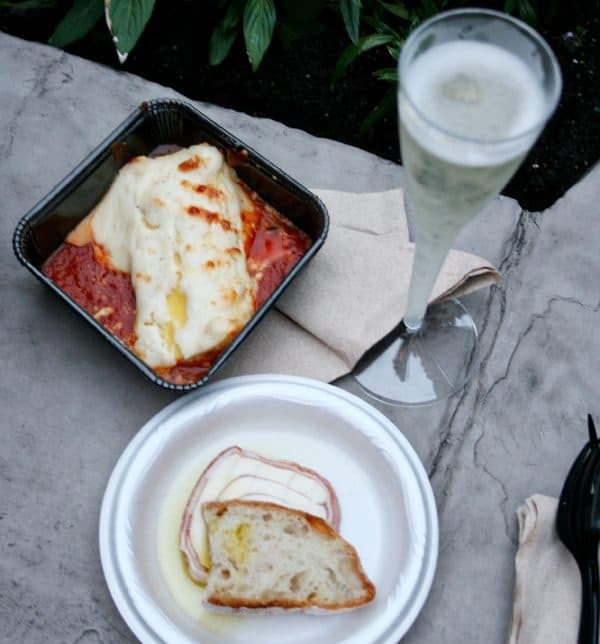 At the kiosks for these events you’ll be able to order fancy appetizers, small servings of a top-notch dish and alcoholic sips. And each one of these mini-delights could be almost the same cost as a full-sized quick service meal! If you’re wanting to indulge in a few of these kiosk treats, stick to a set amount and choose wisely or else your meal budget could be eaten up very quickly. Many of these special Disney events offer a mini gift card on a wristband. Load the card with a set amount and it will help you stick to your meal budget. Kids meal sizes and prices are smaller than full-sized meals. And that can be a both a positive and a negative, depending upon your needs! When I last went to Walt Disney World, I arrived to my hotel late. I was hungry but didn’t want to eat an enormous meal. 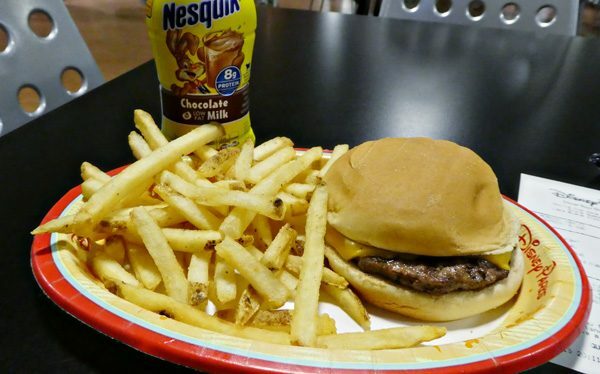 I opted to order a kids meal burger that came with a smaller amount of fries and chocolate milk. It was the perfect size meal for me and came at a much smaller cost than the full-sized adult meal ($6.50 versus $14). I was traveling solo, so ordering this made sense (both portion and price wise). Yes, an adult can order a kids meal! However on the flip side of this, when it comes to ordering meals for my kids I very rarely order them kids meals. I have two kids who are almost the same age so we’ve always purchased them one full-size meal to split between them. Now that we have more kids, we tend to just order several plates of food and then share between us. This offers us a good portion for each person and a greater variety of food as well, as the menu for kids is often limited. Looking for Discounted Disneyland Dining? 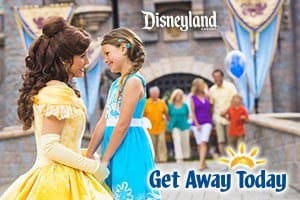 My partner Get Away Today offers discounted Character Dining vouchers for character meals at the Disneyland resort. Click under TICKETS for the DISNEYLAND RESORT. Enter the date of your trip, then click DINING on the left side to purchase discount dining vouchers! 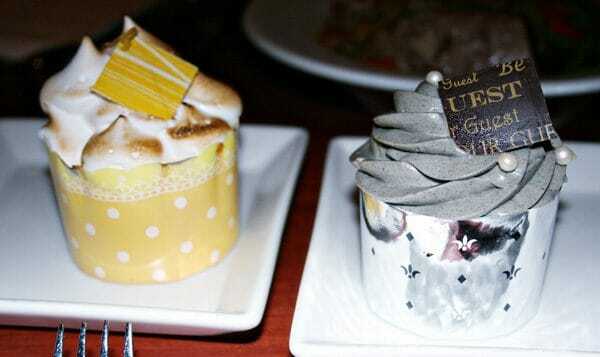 These Lemon Meringue and The Master’s Cupcakes served inside Be Our Guest Restaurant are an astonishing $5.00 each! I can’t believe I spent $10 on these two (quite small) cupcakes! 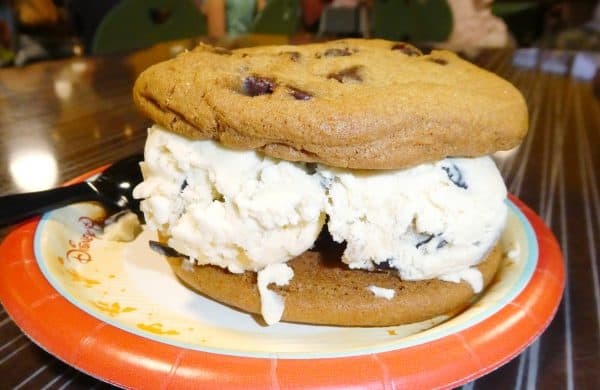 Especially when you can head over to the Plaza Ice Cream Parlor and get two huge chocolate chip cookies with generous scoops of ice cream for only a little over $5. If you’d like to eat one meal full-service but are still trying to be budget conscious, consider sit-down dining for breakfast.When dining full-service, the prices of the dishes will increase at lunch and raise even higher for dinner (in particular when taking about buffets or character dining). 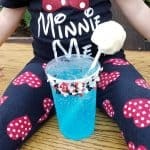 Just about every dining location offers some sort of upgrade to your beverage in the form of souvenir cups, twisty straws shaped like Mickey’s silhouette or flashy glowing colored ice cubes. Naturally these add-on’s come at a steep price! Disney seems to hit pretty hard on the kids menu in this category. 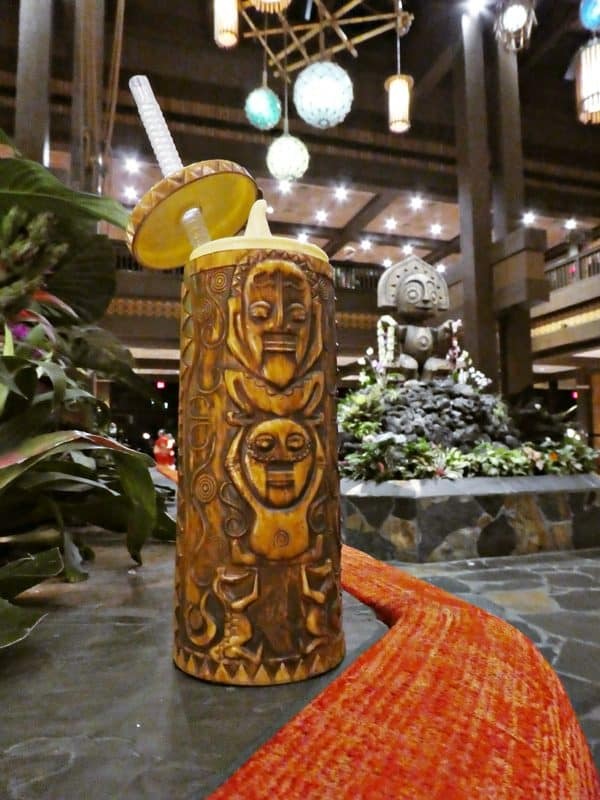 While a standard pineapple Dole Whip in a cup is priced at just over $4.00, the same soft serve in a souvenir tiki sipper will cost you over $10. I bought the sipper in this case for my brother, who collects tiki items. Make sure you work these add-on items into your souvenir budget! No reason to feel trapped with your park-only choices! You can leave the parks and head over a Disney Resort hotel for dozens of more options. Rather than eat inside Magic Kingdom, I hopped the Monorail and had dinner at Capt. Cooks in the Disney’s Polynesian Village Resort. 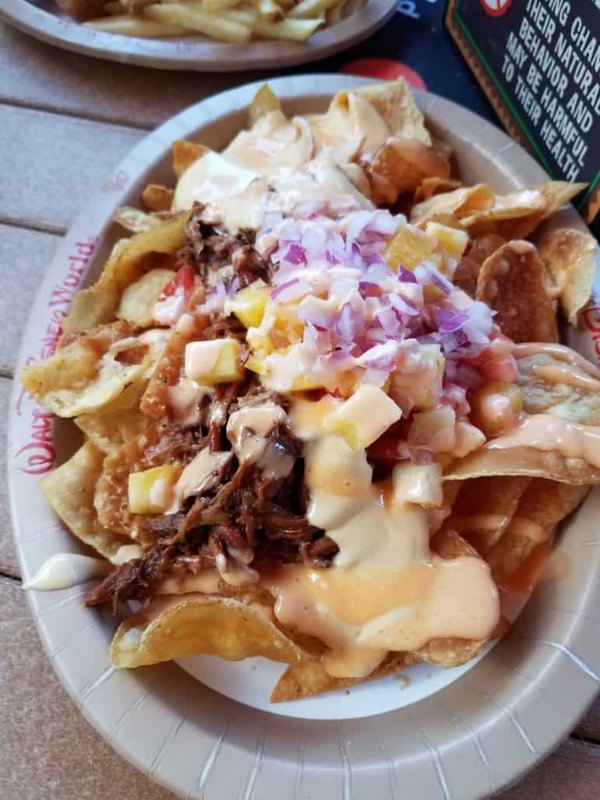 The Pulled Pork Nachos plate was huge and just over $9. I couldn’t eat it by myself it was a very generous portion. There is also a Dole Whip location here, so that was a plus! 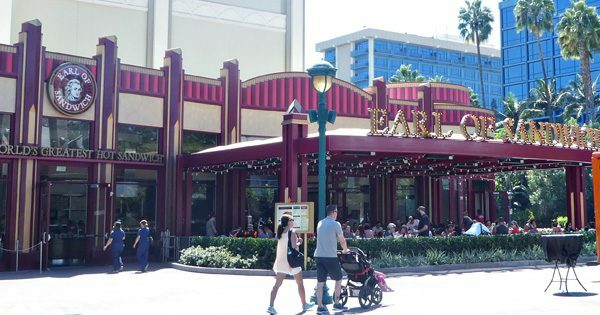 Downtown Disney District at Disneyland and Disney Springs at Walt Disney World also have loads of dining options with budgets that fit everyone. At Disneyland, it’s also pretty easy to walk outside the Park to grab a meal. Restaurants like McDonald’s, Denny’s, Mimi’s and Pizza Press are located outside the gate within a ten minute walk. Purchase Disney gift cards at Target to use when purchasing your meals. When you use your Target Red Card to purchase the cards, you’ll receive 5% off! That may seem like small savings but if you’re eating a lot of meals in the parks and paying for them solely with these Disney gift cards, you’ll be saving good money! Sounds pretty sweet to me! 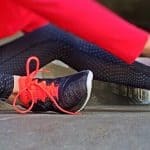 More Ways to Save at Disney! 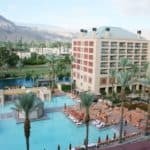 Disney vacations don’t have to be over-the-top expensive. 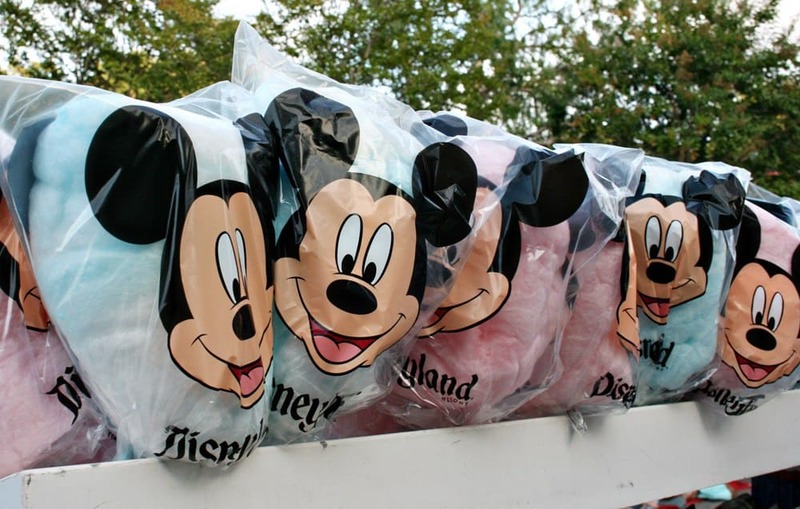 There are lots of ways to have a cheap Disneyland vacation or a frugal Disney World trip! 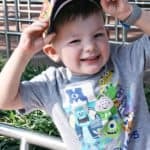 I have several other posts that outline how to eat cheap at Disney parks and other ways to save money at Disney during your trip. 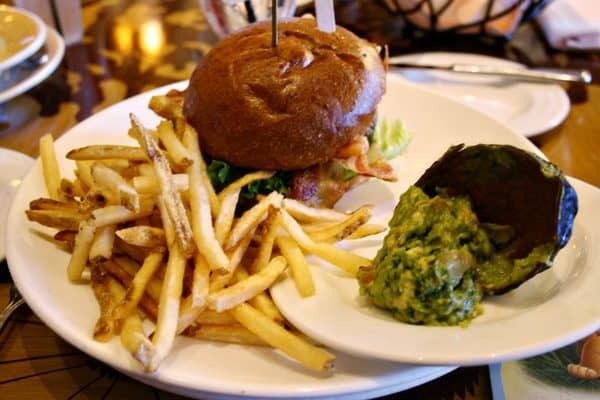 What are the Best Meals for Sharing at Disneyland? How Much Will Your Disneyland Vacation Cost You? Save Money on Tickets at Disney! 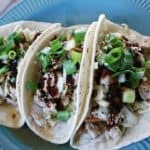 How do you save money on food at Disney? 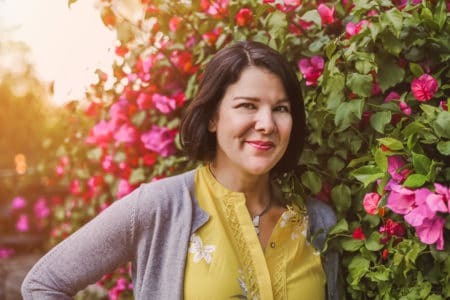 Share your tips with me in the comments! Getting creative with ordering by customizing your meal, sharing plates, or getting kids’ meals is a great way to save money. Sometimes we’re in such a rush to get in and out of a meal that we don’t take the time to think it through. For sure, it does take a bit of advance planning to remember all these little details! We also use Disney gift cards from Target to buy nearly everything at Disney and we share plates a lot. It also doesn’t hurt to ask about discounts. I’ve found some restaurants that give me a discount for my annual pass or my DVC membership or my Disney debit card that I have for my checking account at Chase bank. Thanks for the tips! Yes! We often take advantage of the Disney Visa discount in restaurants as well! I like being able to get a kids meal when I’m not that hungry! That I will say that we were at Tutto Italia (and it is a sit-down, so maybe that’s part of it) and my friend tried to order off the kids menu and they wouldn’t let him. He couldn’t eat anything on the regular menu so he literally did not eat dinner. I’ve had no problem ordering kids items at other sit-downs so I’m not sure what was going on there. Hmmm, I wonder if they didn’t let him order a kid’s meal because it was a full service restaurant 🙁 In his case, I would have tried to make a special request for a meal, the chef is usually pretty accommodating. We are big fans of eating lunch at sit down restaurants rather than dinner and splitting meals. Another good money saver is the free cups of ice water rather than purchasing bottled water. Yes, meal sharing is a big one for our family of 6!